The operators at Dial A Digger are tight access excavation specialists. Trying to take on a huge job in a tiny space? 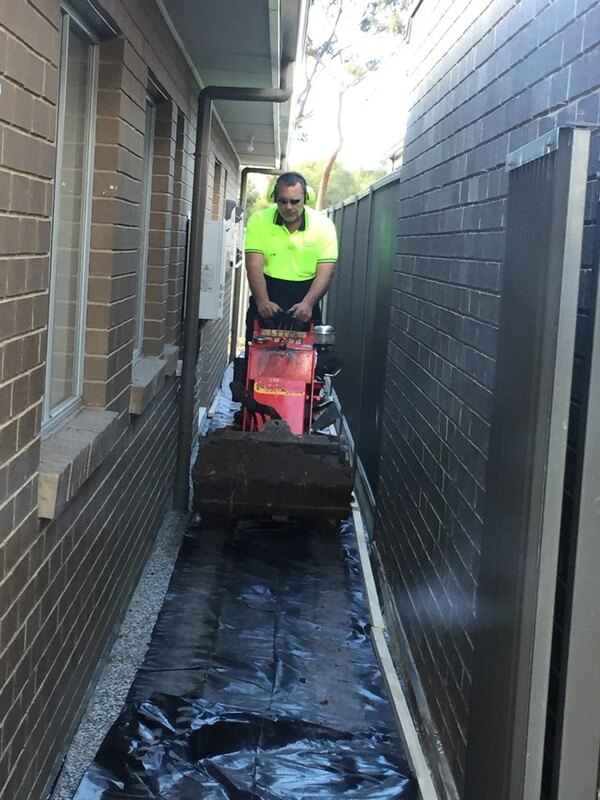 Whether you’re trying to excavate a backyard or an area where normal machinery just won’t be able to access you need the help of one of our tight access specialists. 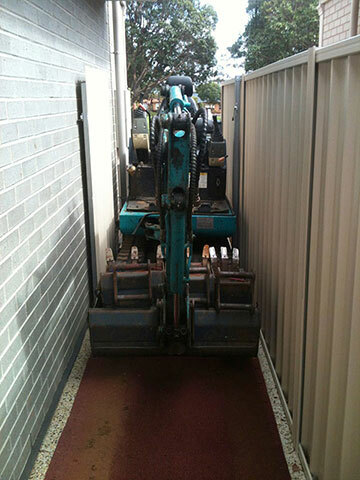 Here at Dial A Digger, just because you have tight access doesn’t mean you can’t get a digger in there. You just need the right organisation, tools and skills for the job. Our skilled operators are able to manoeuvre our mini excavator, mini bobcat, mini dumper and dingo digger in any location where the opening is less than 780mm. All of these machines can fit through small gaps allowing them to reach any site including ones where you have to pass through narrow passages and gates to access them. Our tight access excavators are perfect for any project that requires excavation in a small area. They make short work of small jobs such as digging trenches and holes but are also able to tackle the bigger jobs like carving out footing for a pool or levelling an area ready for new landscaping to be installed. No matter the project and size we are ready to take it on. At Dial A Digger our operators are the best in the tight access excavation business. With years of collective experience and expert training in excavation and trenching, they are well equipped to help with your projects. You will be amazed at the locations our skilled team have been able to squeeze our machines through and operate effectively. From narrow pathways along the side of houses to tiny front yards as long as there is 780mm of space we can get there. If you are wanting to take on a new large-scale excavation project in your home or business but can’t find a machine small enough to reach the site, give the team at Dial A Digger a call. 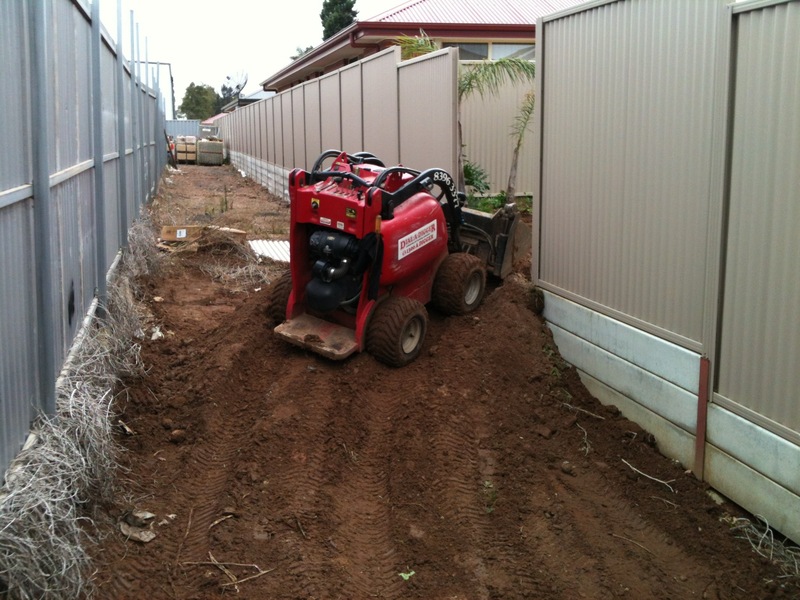 Our Mini-Excavator, Mini Bobcat, Mini Dumper and Dingo Digger can fit into spaces under a meter wide with ease, making them perfect for any project with limited room. Our services areas include Adelaide, Melbourne and their surrounding areas such as Werribee, Dandenong, Seaford, Brighton, Tea Tree Gully and Munno Para. When you need a tight access specialist, you need Dial A Digger, all we need is 780mm!